Renting projectors can be a hairy business. It’s really something best left to professionals because setting up a projector is both a science and an art. Still, many people choose to rent and set up their own projector. If you fall into this crowd, let me, at least, give you some advice to make sure you run into as few of the common projector rental problems as possible. We all want your event to go off swimmingly. For those of you who are dab hands in the audio visual world some of the below will seem like common sense but they are the most common projector rental issues that we’ve come across. For more info about what to remember for AV shows make sure you check out our audio visual checklist but for now lets go through some common projector problems. Don’t rent a projector with a very high bulb life. What qualifies as a high bulb life changes based on the projector so you’ll have to do some research there. Don’t run the risk of the bulb dying in the middle of your big event. A good AV rental company will tell you in advance what the lamp status is. For the same reason that you should check the bulb life, be very careful transporting the projector. Most projectors still use a traditional bulb and not a laser or LED light source (check out some different projector technologies here). Halogen lights don’t take kindly to being knocked around. Neither do the LCD panels or color wheels. You don’t want to rent a projector to find out it won’t turn on after transporting it or the picture is off. A rental projector should come in a flightcase. Projector positioning is incredibly difficult. It takes a lot of planning to setup. You really need to know where the projector is going to go before you rent it (so that you know how big of a projector to get). The projector shouldn’t be positioned at an angle where you would need to use any type of key stoning to fix. Key stoning can ruin picture quality. Likewise, you don’t want the projector to be positioned in a place where people might potentially have to look at it or have it shining in their eyes. Also, don’t put the projector in a place where people could walk in front of the projection and ruin the picture. This tip leads from the prior tip but is incredibly important. Projectors all have a different throw. That means that that each projector will need to be placed at a different distance to produce the same 100-inch picture size. Projectors typically have settings to adjust the throw to some degree, but it’s best if that setting is left as low as possible (for reasons that are beyond the scope of this article, but we will covered in a future blog). Plan ahead. Know where you are going to put your projector and measure the distance to the screen. Give the rental company this information so they can give you the proper projector. Don’t hang up a sheet and call it the day. The projected image will look washed out and horrible. Be sure to use a good projector screen. If possible, use a fixed screen rather than a pull-down screen. If you really need to, a white or eggshell painted wall with a satin finish will also work in a pinch if it has almost no texture to it. Just make sure to clean the wall thoroughly first and only use it as a last resort. Most people use the stock settings on the projector. Don’t do that. Calibrate the picture settings of the projector in the same lighting you intend to use it. Don’t calibrate the picture in a brightly lit room or a room darker than what you will use. There are a lot of good videos out there that will walk you through calibrating an image. Use one of them. It will be worth the time. 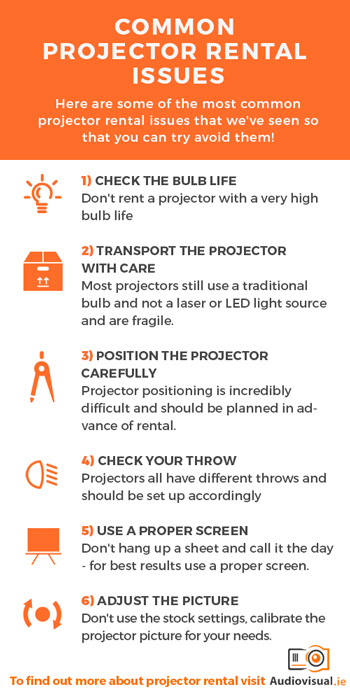 So there you have it, some of the most common rental projector problems that we see people making (and made myself, albeit many moons ago!). If you have any questions about projector rental feel free to call us on +353 1 4133892, contact us online or email me directly ivan@audiovisual.ie.